Santa Cruz County has 29 miles of gorgeous coastline. With tons of beaches to choose from, you may have a hard time picking one or two to visit. To make that decision even harder, some beaches are great for only a few activities. To make finding the perfect place for your day at a Santa Cruz beach easier, here's a list of the best Santa Cruz beaches by type and interest. If you're planning to go to one of these beaches, you should know that one stretch of Santa Cruz sand can go by two or three names. We've tried to use the "official" names here, the ones you'll find on signs and in print. If you ask a local for directions, don't be surprised if they can't help. They may just know it by a different name. 20,000 of our readers voted in a poll to find out their favorite Santa Cruz County beaches. 32% like Bonny Doon. Capitola and Seacliff tied for second place with 15% each. The rest in order were Sunset Beach, Main Beach, and Seascape. Main Beach and Cowell Beach are like bookends for the Santa Cruz Municipal Pier, near the Santa Cruz Beach Boardwalk. They're crowded in summer, but an enjoyable place to rest, play and take a break from the amusement park rides. If it makes any difference to you, this is how to tell which beach is which. If you're facing the pier and the ocean, Cowell Beach is on the right and Main Beach on the left. What is There to Do at Main Beach? Many people combine a visit to Main Beach with a trip to the Santa Cruz Beach Boardwalk amusement park. Besides having fun on the boardwalk, you can play volleyball at the nets on Main Beach. Some people go fishing from the pier. If you want to try that, you should check out these tips first. Others go surfing at Cowell Beach, which is reputed to be one of the best places to learn how to surf. You can rent kayaks and boats on the nearby pier. In the summer, the Boardwalk often sponsors free concerts on Main Beach. There's plenty of food available, on the pier and along the main street nearby. You can find good junk food (if you like that kind of thing) at the Boardwalk, including the frozen pineapple concoction called a Dole Whip (which was once only available at Disneyland). The beaches don't have a dedicated parking lot, but you can park anywhere nearby. There's a charge for parking on the pier and on most of the nearby streets. Beach wheelchairs are available, with fat tires that let them go onto the sand without getting stuck. Here's how to rent one. Sadly, Cowell Beach topped Heal the Bay's 2015 Beach Bummer list for dirtiest water on the West Coast. Main Beach is very close and likely to have similar conditions. If you're concerned, you can check the latest water quality warnings at the Santa Cruz County website. The beaches are at the foot of Bay Street. The easiest way to get there is to follow the signs for the Boardwalk and pier. Capitola is one of California's prettiest little beach towns, with the beach right in the middle of town. It has beautiful views of the Monterey Bay and sailboats moored offshore, and a string of colorfully-painted cottages and shops along the water add a festive touch. The beach has soft, light-colored sand that is kept very clean and it's a family friendly place. This little beach town is popular and busy on the weekends and the beach will be packed then, too. If you go on a weekday or during nice weather off season, you may feel like you have the place to yourself. You'll find restrooms and outdoor showers at the beach and there are plenty of places to get food in town. No fires are allowed on this beach. What is There to Do at Capitola Beach? 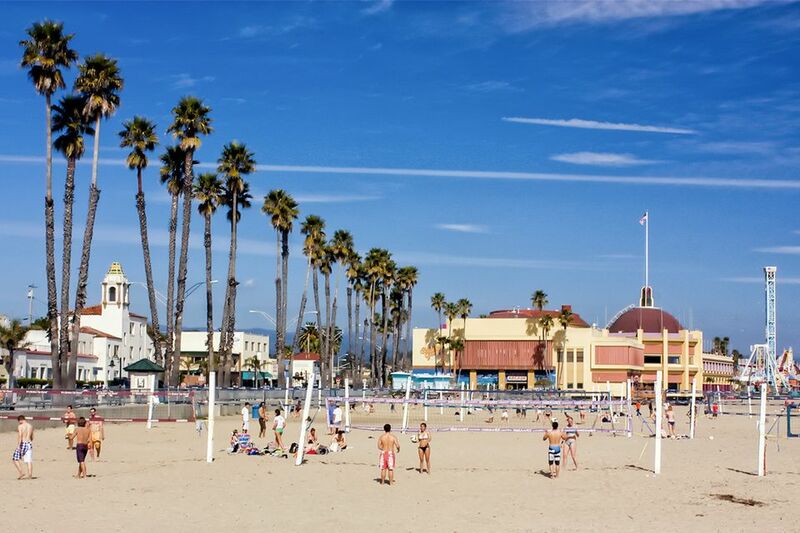 You can do most of the common beach activities in Capitola: swimming, beach volleyball, surfing and fishing from the pier. There's a lifeguard on duty during the busy season. You can also rent fishing boats at the pier. Capitola Beach Company offers surfing and paddleboarding lessons if you want to learn how. Some people say it's a better place to learn than in Santa Cruz because the waves are gentler. If you're thinking of surfing, check the surf forecast. There's no entrance fee at the beach, but you'll have to pay to park at a meter in downtown. Or park in the visitor's lot up the hill above the railroad track on Monterey Ave. and walk or take the shuttle to town. No pets are allowed on Capitola Beach, but they're welcome around town. Save your alcoholic beverages to enjoy at home and leave your glass containers there, too. They're not allowed on the beach. You don't have to lug all your stuff to Capitola Beach to have fun. In the summer, Capitola Beach Co. sets up a stand near the end of the beach where they rent boogie boards, wetsuits, umbrellas and beach chairs, plastic buckets, etc. Santa Cruz area beaches are often foggy in early summer and sometimes it lasts all day long. You'll find clearer skies in late summer, spring or fall. Water quality is generally good in Capitola, but in case you're concerned, you can check the latest water quality warnings at the Santa Cruz County Health Services website. Capitola Beach is in downtown Capitola. Exit CA Hwy 1 at Soquel Avenue or 41st and drive toward the ocean, following the signs toward downtown Capitola. Seacliff Beach is a narrow, flat and beautiful stretch of sand between the cliffs and the ocean. It's an excellent place for beach play and has a pier that's popular with fishermen. The most notable feature at Seacliff State Beach is old cement ship that sits at the end of the wharf. One of three cement ships built in Oakland during World War I, brought here in 1929 to become an amusement center. Seacliff's location is beautiful, especially on a clear day. The old ship is so intriguing it's hard to keep your eyes off it. It's off limits to the public, though. People really like Seaclff Beach, saying it's less crowded than the beach in town. Their only complaint is that you have to park in a big lot on the clifftop and walk down to the beach from there. You'll find restrooms at the beach and picnic tables nearby (although some are across the road from the sand). The Beach Shack sells food on the beach (but only on busier days). You'll find the Sno White Drive In up the road just a few blocks from the entrance and a grocery store just on the other side of CA Hwy 1. Seacliff is one of the places in California where you can camp at the beach. If you'd like to do that, use the Seacliff Beach camping guide. What is There to Do at Seacliff Beach? You can also play on the beach, or check out the Visitor Center's displays on wildlife and the history of the area, and their touching pool that's popular with kids. Signs on the beach warn of rip currents and an uneven bottom, making swimming dangerous. Fires are not allowed on the beach, but signs warn that hot coals from illegal fires may be left hidden in the sand. Santa Cruz beaches can be foggy in early summer, sometimes all day long. Water quality is generally good at Seacliff Beach, but in case you're concerned, you can check the latest water quality warnings at the Santa Cruz County Health Services website..
Seacliff Beach is 5.5 miles south of Santa Cruz. Exit CA 1 at State Park Drive and go a short distance toward the water to the park entrance kiosk. ©2014 Monica Bourne. Used by Permission. Sunset Beach is a wide, pretty beach with whitish-colored sand dunes between the parking lot and the beach. You can camp at Sunset Beach - all the details are in the Sunset Beach Camping Guide. What is There to Do at Sunset Beach? You can catch surf perch and sardines on the beach, but need a fishing license to do it. There's a remote control glider port in the dunes - fun to watch even if you don't own one. Entrance fee is charged which includes parking. Sunset Beach is such a lovely beach that it's very popular, and the limited parking spots fill up early. You'll find restrooms at the beach. Group picnic tables are available, and they have a shelter, but sand dunes block their view of the water. Beach bonfires are allowed (in fire rings only). There are no stores or other places to get food nearby. The park is 16 miles south of Santa Cruz off Highway One. Take the San Andreas Road exit. Lighthouse Field State Beach is located along West Cliff Drive, stretching from Columbia Street to Pelton Avenue. The Santa Cruz Surfing Museum is there, in the Mark Abbott Memorial Lighthouse, and just off the point, geography and ocean waves join forces to create the surf and waves at Steamer Lane that Santa Cruz is famous for. It's a stunningly beautiful place, with ocean views and a flat, paved path along the cliff top. It's great for a stroll, but you can only get to the sandy beach in a few places. What is There to Do at Lighthouse Field State Beach? Most people go to this beach area for surfing or boogie boarding. Steamer Lane is one of the areas where California surf culture began and Jack O'Neill's surf shop was nearby for many years. If you want to go surfing, check the surf report here. Lighthouse Field is also a place for taking a scenic walk. You can watch the surfers - when the waves are good. Legendary Steamer Lane is best viewed from the overlook near the surfer status. Even when the water is as calm as a bathtub, you can look out across the Pacific and watch the birds, including the rare Black Swift.You might even spot a California sea lion on the rocks or see a dolphin swimming by.a dolphin swimming by. A visit to the Surfing Museum is also a fun way to spend a little time. Inside, you'll find photographs, surfboards, and other memorabilia from more than 100 years of surfing history in Santa Cruz. People also go kayaking at Lighthouse Field (on calm days). Lighthouse Field State Beach hosts "Caroling Under the Stars" each Christmas, It's a Santa Cruz tradition which attracts hundreds of locals and visitors. Pets are allowed on the cliffside trail. Information online is inconsistent, but the majority say the beach is dog-friendly, too. Lots of dog owners and their pets go to Lighthouse Field. If you are afraid of dogs or would just rather not have them running all around you, this may not be the best place for you. Steamer Lane Supply provides concession services at Lighthouse Field, with food and surfing supplies. Water quality is generally good at Lighthouse Field, but in case you're concerned, you can check the latest water quality warnings at the Santa Cruz County website. If this summary doesn't answer your questions, you can check the Lighthouse Field State Beach website. You can also get updates a the Friends of Santa Cruz State Parks website. Lighthouse Field State Beach is on West Cliff Drive, on the north side of Santa Cruz. From the Boardwalk and downtown, take Pacific Avenue to West Cliff and follow it along the clifftops. From Highway 1 north of downtown Santa Cruz, start by following the signs toward Natural Bridges State Park. Turn south onto Swift Street (at the traffic light). Go toward the ocean to a "T" junction. Stop following the Natural Bridges signs at that intersection and turn left onto W. Cliff Drive. If you're using GPS or maps app, use 740 West Cliff Drive as the address. Waddell Creek Beach is one of the most popular places along California's central coast to windsurf, with steady, strong northwest winds and good waves. It's a challenging place to practice the sport, busy on good days and not for novices. It's also a fun place to watch all the action, with the waves breaking close to shore. What is There to Do at Waddell Creek Beach? From March to September, Waddell Beach is well known as a great place to go windsurfing and kite surfing. The challenging conditions aren't recommended for novices, though. If you're like me and prefer to stay firmly on dry land, you may just want to stand and watch the expert windsurfers. These folks can launch themselves from the top of an incoming wave and do a full loop in the middle of their ride. Regular surfers and boogie boarders also like Waddell Creek Beach. You can check the surfing conditions at this website. There have been reports of shark incidents here, so enter the water with care. When the wind isn't blowing, Waddell is a lovely, clean beach to visit. The sand is good for building sand castles and with all the wind, it's a good place to fly a kite, too. At low tide, you may find a few tidepools near the south side to explore, too. At high tide, the beach may completely disappear. You can also go bird watching on the inland side of Hwy 1, in the Theodore J. Hoover Natural Preserve. Water quality is good, but in case you're concerned, you can check the latest water quality warnings at the Santa Cruz County website. Like all California beaches, Waddell Creek is prone to be foggy from May through June, sometimes all day long. Regulars say if there's a bit of sunshine anywhere along the coast, it's likely to be here. Few (if any) cell phones can get a signal at Waddell Creek. You can walk to the top of the nearest hill or use a call box along Highway One if it's an emergency. Waddell Creek Beach is on CA Hwy 1 about 20 miles north of Santa Cruz. The entrance is across the road from call box SZ 1 364 and just north of the Waddell Creek Bridge. Waddell Creek Beach is part of the Big Basin Redwoods State Park, and you'll see that name at the top of the sign. If you don't know how to navigate using call box numbers and mile markers, here's how. The individual beach pages give details about the beaches, but you may be more interested in finding the best beach for what you want to do. This list highlights the things people like to do at the beach and the best places to do them. Main Beach: The Santa Cruz Beach Boardwalk is at Main Beach. It's one of California's most classic oceanfront amusement parks. Capitola and Main Beach: You'll find plenty of nets here, but beware of going in the water at Capitola. This beach has some of the worst water quality in the area. Seacliff and Sunset: These are popular places for beach bonfires. Arrive early to stake out the best spots. Main Beach: The boardwalk is nearby and lifeguards on duty during the busiest times. Main Beach: With all the goings-on at the adjacent amusement park, this place is people watcher's heaven. Seascape: The long, sandy beach just below this seaside resort is accessible to everyone, but it's seldom crowded. For a romantic, seaside, sunset stroll without getting sand in your shoes, try the walk along West Cliff Drive. Steamer Lane: Pioneering big-wave surfers got their start at Steamer Lane. It still boasts the area's best surfing, but the locals don't tolerate outsiders well unless they know their stuff. Don't miss the nearby Surfing Museum. Beginning surfers may like Cowell Beach better. You can find a few place to camp right at the beach in this Guide to Beach Camping in Northern California. Judging from the cars parked along Highway One Bonny Doon is the local favorite. Beaches marked with pushpin symbols are clothing optional. Beaches marked with balloon symbols are not. If you want to get a closer look, zoom in or get driving directions and distances, check this Google map directly.